Heading back home, Mount Shast is our traveling partner for 100 miles or so. I realized that most of my mountain photos were always with the hope of having a clear view of the peak of the mountain. Why is that? Maybe because mountains create a sense of awe for me that comes darn close to being a religious experience – and I want my religion to know all the answers…as symbolized by a clear mountain peak. Yet, Life is not like that. Life is mysterious. The mystery exists up high in the “clouds” of our lives…not clearly seen. Still, as in the above photo of Mount Shasta, the base of our “mountain of mystery” is easily seen just by taking the time to observe what is all around us. 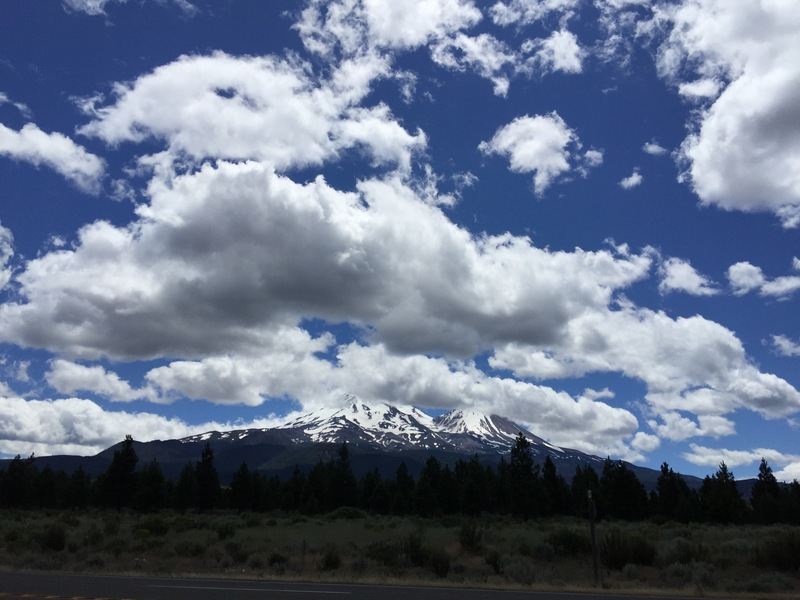 The clouds that hover over the top of Mount Shasta are a blessed reminder to appreciate the known and perhaps the never to be known…at least on this trip.